Consumers can bring back smoked salmon that has been recalled over possible contamination with the listeria monocytogenes bacteria for a full refund, said Walmart. The products, which were distributed to retail outlets between Nov. 12 and Dec. 21, can be brought back into its Sam’s Club stores and buyers can get all their money back, the retail giant said. A DONEGAL fish farm has been halted amid concerns all fish farms in the county could be facing new restrictions. The authority which regulates fish farms in the country has also issued a strongly-worded statement questioning the number of jobs created by them. It has questioned one new fish farm in Galway Bay and is opposing two others – in Donegal and Mayo. It says scientific studies show sea lice from farmed salmon are wiping out wild salmon stocks off the Irish coast. The Inland Fisheries Ireland (IFI) is the state agency charged with the conservation, protection, development, management and promotion of Ireland’s inland fisheries and sea angling resource. The Board of IFI agrees with the recent statement by Minister Fergus O’ Dowd on offshore salmon farming and welcomes the development of Ireland’s aquaculture sector, once any development complies with Ireland’s obligations under relevant EU environmental legislation, particularly the Habitats Directive, and does not adversely affect salmon and sea trout stocks. The Board have made a submission on the Environmental Impact Statement (EIS) prepared by Bord Iascaigh Mhara (BIM) for the proposed offshore salmon farm as part of the public consultation process, and recommends that this submission, which is on the IFI website, is read in full by any interested parties. In the submission, concerns were raised in relation to the location and scale of the proposed salmon farm and how its development and operation could impact on wild salmon and sea trout stocks and their habitat. These concerns are based on scientific reports by respected authors and knowledge of the impact of existing fish farms on salmon and sea trout populations off the west coast of Ireland. Recent peer reviewed international scientific literature on the impacts of sea lice on salmonids show them to have devastating effects on wild salmon, accounting for up to 39% of salmon mortalities. The Board does not believe that the corpus of peer reviewed international scientific literature which recognises the negative impacts of sea lice on salmonids have been adequately dealt with in the EIS. The Board says it welcomes any sustainable initiative which will provide jobs in rural coastal communities however it queries the figure of 500 jobs being associated with the proposed offshore salmon farm. Published data on employment and production in the salmon farming sector show that 9,923 tonnes of salmon were produced in 2007 and 133 Full Time Equivalent (FTE) people were employed in salmon farming. If the same ratios, 74.6 tonnes of salmon per person employed, are used in the context of the current proposal for a 15,000 tonne salmon farm this accounts for only 202 jobs. A very recent report in aquaculture news site www.fishnews.eu claims that Scottish Islanders were delighted that a new 2000 tonne salmon farm had been granted planning and would create 4 full time jobs. “Again if applying the same ratios to the current proposal this amounts to 30 jobs, assuming no economies of scale,” said the IFI. The statement went on: “Notwithstanding this the Board have serious concerns that whatever the number of jobs created by the current proposal they will be more than offset by the associated loss of jobs in the recreational angling and tourism sectors if this development proceeds without adequate environmental protections in place. “Top line figures from a recently commissioned survey of domestic recreational anglers suggest they contribute approximately €143 million to the economy, predominantly in rural areas, with the preferred locations for angling overnights in the West and South West and an additional €89 million is contributed by tourist anglers. “The Board believe that Ireland’s reputation as a pristine wild fishery destination must be safeguarded. Angling tourism is characterised by the fact that consumption takes place where the resource is readily available, such as on the West Coast. “Tourism activity is particularly concentrated in areas which lack an intensive industry base, and it is credited with having a significant regional distributive effect. Consequently, the economic benefit is kept within Ireland, and not expatriated to another country which would most likely be the case if an international operator was awarded the franchise to run the proposed offshore salmon farm. 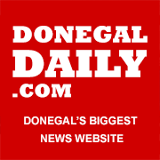 “The Board believe that proposals being brought forward for two further offshore salmon farms in Mayo and Donegal are premature given that significant issues over the current proposal have not yet been resolved. No further applications should be progressed until all stakeholders are satisfied that the current proposal is sustainable and has no adverse impact on wild salmon and sea trout stocks. A Galway West TD has expressed serious concerns over a proposed deep sea salmon farm off Inis Oirr. Deputy Noel Grealish is worried about the effect the farm will have on wild salmon and sea trout numbers. Research has shown that infestations of sea lice concentrate in salmon farms and this can pose a serious threat to wild salmon and sea trout during their migration period. Deputy Grealish raised the issue with Taoiseach Enda Kenny in the Dail and he hopes it will be dealt with in the New Year. As I am sure you are aware, Minister for Marine, Simon Coveney, is planning to push through plans to build massive Salmon fish farms on the west coast of Ireland. As an Angler, I believe that this move will have a very negative impact on tourism in Ireland, as these farms are widely known to damage all sorts of marine life in Bay's/ Estuary's. Angling is a large jewel in the crown of tourism in Ireland, and the King of fish, the Atlantic Salmon, is the main attraction for tourist anglers and local anglers alike. We have seen the massive amount of damage that these farms have done in Chile, Scotland, Norway and Canada, and if this were to happen here, then almost certainly tourism will be severely affected. The facts are very well known internationally about these dangerous fish farms, and the Minister is hiding these facts for financial gain, but there won't be any gain, but simply disaster for a small country that depends on the Tourism industry to boost it's economy. The Minister states that up to five hundred jobs will be created with these farms, and I personally don't think that it takes a mathematician to work this equation out. Please help to stop this utter madness of a plan, before it's too late." Why salmon farms are harmful to our Native Species? Watch this short educational youtube video on how salmon farms are killing our native wild salmon and sea trout numbers. The proposed salmon farm in Galway, could be the biggest in Europe will have the ability to decimate all of our native salmon and sea trout. Will you let this happen? 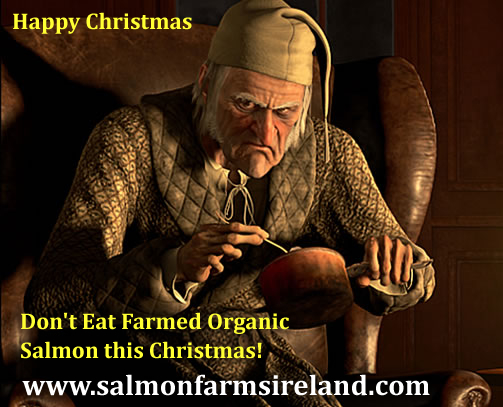 Complain to your local TD now and join all or any one of the many Anti Salmon Farm Groups in Ireland. As the name implies, it causes severe anemia of infected fish. Unlike mammals, the red blood cells of fish have DNA, and can become infected with viruses. The fish develop pale gills, and may swim close to the water surface, gulping for air. However, the disease can also develop without the fish showing any external signs of illness, the fish maintain a normal appetite, and then they suddenly die. 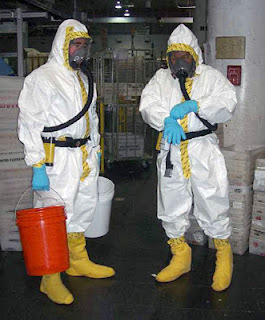 The disease can progress slowly throughout an infected farm and, in the worst cases, death rates may approach 100%. Post-mortem examination of the fish has shown a wide range of causes of death. The liver and spleen may be swollen, congested or partially already dead. The circulatory system may stop working, and the blood may be contaminated with dead blood cells. Red blood cells still present often burst easily and the numbers of immature and damaged blood cells are increased. Infectious salmon anemia appears to be most like influenza viruses. Its mode of transfer and the natural reservoirs of infectious salmon anemia virus are not fully understood. Apart from Atlantic salmon, Sea Trout can be infected to, but do not become sick, so it is thought possible that these species may act as important carriers and reservoirs of the virus. Salmon and sea trout anglers along with inshore fishermen insist a planned explosion of giant fish farms on the west coast will lead to a senseless destruction of the Irish environment and damage key industries. It has been claimed that thousands of existing jobs in tourism, angling, and shellfish industries will be wiped out by Bord Iascaigh Mhara (BIM) proposals to create mega salmon farms off Inis Oírr in the Aran Islands. More than 200 people from all over Ireland protes-ted on Saturday outside Marine Minister Simon Coveney’s constituency office in Carrigaline, Co Cork. 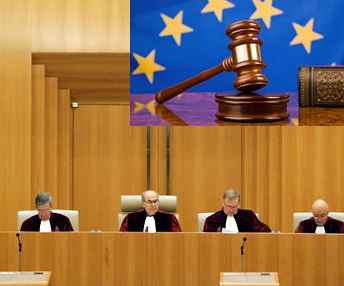 Mr Coveney had signalled in advance that he would not be present to receive a petition. “Our mission,” said Glenda Powell from Cork’s Blackwater Lodge and salmon fishery, “is to strive to safeguard our wild salmon and sea trout, their marine habitat, and inland waterways. 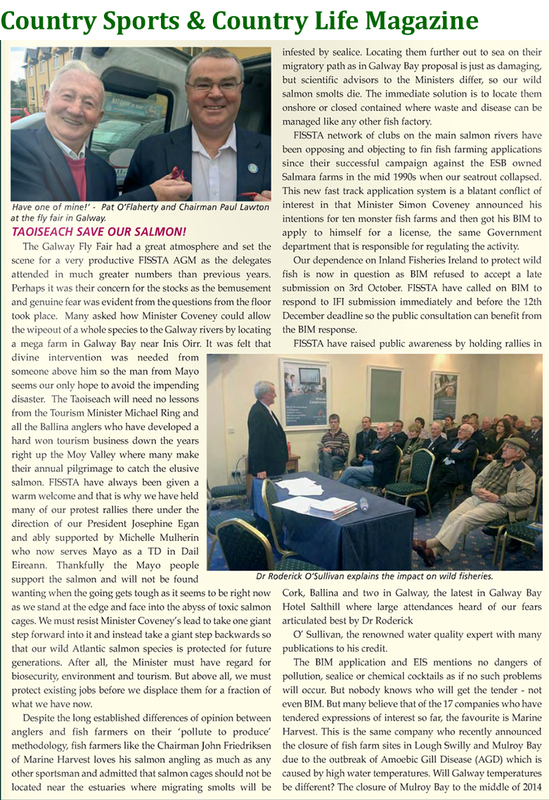 The Federation of Irish Salmon and Sea Trout Anglers (Fissta) put into the letterbox of Mr Coveney’s closed office an objection to the proposed deep-sea salmon farm in Galway Bay. Fissta is being backed in its objection by organisations such as No Salmon Farms at Sea, Salmon Watch Ireland, An Taisce, Coastwatch, Friends of the Irish Environment, Irish Seal Sanctuary, Save Bantry Bay, and Save Galway Bay. Alec O’Donovan of Save Bantry Bay said a World Wildlife Federation report on salmon farming had “been buried” out of embarrassment by the Government due to the environmental risks. The WWF report claimed excessive use of chemicals such as antibiotics, anti-foulants, and pesticides could have “unintended consequences for marine organisms and human health while viruses and parasites that transfer between farmed and wild species, as well as among farmed species, present a risk to wild populations or other farms”. Brian Curran from Save Galway Bay said anglers have been the watchdogs of the environment and object to the industrialisation of deep water bays. London-based Dr O’Sullivan said the Department of Marine “refuses to listen to any voice but its own”. Taxpayers’ money, he said, would support a reckless explosion in salmon farming. “We voice our objections to the building of giant salmon farms killing off more of our wild salmon and sea trout; we also object to the huge volumes of filth and toxic wastes from these farms; we object to the huge volume of insecticides, fungicides, and dangerous chemicals flushed into our shallow bays and estuaries, and, furthermore, we object to the gross exaggeration of 500 jobs to be created.” He said salmon farming was highly mechanised, required fewer and fewer workers, and “any new menial jobs created will be cancelled out by local job losses in key industries such as angling and tourism”. He said it was bizarre that Mr Coveney, who has responsibility for BIM, was asking the state agency to apply to his office for a licence to build the farms. With questions hanging over the future of the wild Atlantic salmon, a big money-spinner for Irish tourism, few issues provoke more heated controversy than the operation of fish farms off Ireland’s coasts. The impassioned nature of debate around this contentious topic was seen at the weekend when 200 people from all parts of the country gathered in the rain outside Marine Minister Simon Coveney’s constituency office in Carrigaline, Co Cork. Their protest was against a Bord Iascaigh Mhara (BIM) proposal to locate giant salmon farms off the west coast. Jobs, money, and environmental concerns already dominate debate on both sides of this argument. For BIM, the aim is to create 500 jobs at three super-sized deep-sea salmon farms, the first at Inis Oírr in the Aran Islands, each with an annual harvest capacity of 15,000 tonnes. Doubtless, the opening of the China market to salmon exports from Europe is an influential factor. For the opponents of this development — anglers, fishing organisations, stakeholders, hoteliers, restaurateurs, and islanders — the fear is that if such projects go ahead they will make thousands of existing workers redundant in tourism, angling, and the shellfish industry. Meanwhile, amid the ongoing battle of words, the survival of wild salmon is in question. Recently thought to have been "saved" from virtual extinction by the removal of drift nets, the Irish salmon is now believed to be at risk from hazards that include climate change, river and lake pollution, as well as alleged poaching and illegal drift netting off the Donegal coast. Scientific research suggests that valuable salmon stocks off the west of Ireland are in danger of being decimated by a predicted explosion of sea lice, lethal parasites which invariably multiply around fish farms and are claimed to kill large numbers of free-ranging salmon in European waters every year. According to BIM, the State agency responsible for developing the seafood industry, its handling of this project marks a "new departure" in planning terms. It will act as the licence applicant for all three farms, with the licences being held in trust for the State and commercial developers operating the business under a franchise agreement. To give Mr Coveney credit, he signalled in advance that he would not be present to receive a petition from the protesters picketing his constituency office. However, he risks compromising his ministerial position as he is widely perceived as supporting the BIM project. Arguably, he could be accused of conflicting with the public interest if his department grants BIM the licence. With such a controversial decision in the balance, the Government will be in the firing line if jobs are put at risk in a region so heavily reliant on tourism. It would be a travesty if objections to the BIM proposal were dismissed out of hand by the administration because of ministerial support for the venture. To bring transparency and objectivity to this heated dispute, there should be no question of matters being decided behind closed doors. The conflicting interests make it imperative that BIM’s plans for three giant salmon farms be scrutinised in the public gaze. Anglers and environmentalists have called on the Minister for the Marine Simon Coveney to intervene to prevent the establishment of a number of major salmon farm projects at various locations off the Irish coast. About 200 campaigners from as far away as Donegal, Fermanagh and Galway as well as from Cork, Kerry and Tipperary converged in Carrigaline in Co Cork on Saturday, from where they marched to Mr Coveney’s constituency office and handed in a letter of protest. 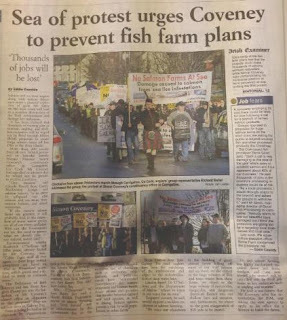 Mr Coveney was not at the office at the time, but the protesters held a rally where speakers urged him to heed warnings that further salmon farms at sea would lead to an increase in sea lice and damage wild Atlantic salmon stocks. Bord Iascaigh Mhara has applied for a licence for a €60 million deep-sea salmon farm on a 500 hectare site in the lee of Inis Oírr, the most southerly of the Aran Islands, with the promise of creating 500 jobs in the area. Separately, Norwegian owned company Marine Harvest Island is proposing a €3.5 million salmon farm for Shot Head off Adrigole in Bantry Bay in west Cork as part of a €14 million investment in its 16 aquaculture sites in Irish waters. Shoppers are being encouraged to boycott farmed salmon by Irish anglers, coastal communities, and environmentalists opposed to the further expansion of fish farms around the coast. Campaigners say wild salmon and trout stock are threatened by the salmon farms, that traditional shellfish grounds will suffer, and that seawater will be poll-uted if the increase in salmon farms goes ahead. Up to 150 people atten-ded a meeting in West Cork last month aimed at discussing the Government’s plans to promote salmon farming around the coast. Attendees agreed to picket Agriculture Minister Simon Coveney’s constituency office in Carrigaline on Saturday and to ask the public to boycott farmed salmon. Earlier this year, the Save Bantry Bay group was set up to fight Marine Harvest’s plans to develop a 100-acre organic salmon fish farm at Shot Head. Local fishermen, tourism interests, and anglers in the Aran Island are drawing up submissions to object to Bord Iascaigh Mh-ara’s planned 500-hectare deep-sea salmon farm 6km off Inis Oirr. Kerry anglers also oppose BIM’s tentative proposals to develop another salmon fish farm at Ballydavid. BIM aquaculture manager Donal Maguire yesterday told RTÉ the boycott was “an ill-considered and unfortunate move, as Irish smoked organic salmon is a premium product renowned all over the world” and that supporting the boycott would put Irish jobs at risk. Last month, Inland Fisheries Ireland (IFI) accused BIM of overestimating by 60% the number of jobs that will be created at the fish farm it wants to build off the Aran Islands. In a submission on the proposed farm’s environmental impact, the state agency charged with the protection of Ireland’s fishing rivers and sea angling, IFI warned that the farm is likely to produce up to 200 jobs, rather than the 500 promised by BIM. BIM said it was evaluating IFI’s submission and could not comment. However it stood over its figure of 500 jobs. A further 150 jobs would be created indirectly in the service sector, it said. A call for a national boycott of farmed salmon products was yesterday condemned as an act of sabotage. 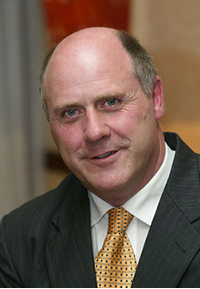 The aquaculture executive of the Irish Farmers’ Association, Richie Flynn, warned that the ill-conceived boycott posed a serious threat to a vital farming and processing sector for marine communities. Environmental groups are seeking a national boycott “as a gift to the environment for Christmas” as opposition mounts to plans to locate huge salmon farms along the west coast. The boycott is being led by Friends of the Irish Environment, a group which claims huge open-pen salmon farms planned for Galway Bay, in addition to an expansion of a Norwegian-owned farm in Bantry Bay, will devastate the coastal environment and destroy wild salmon stocks as well as tourism. 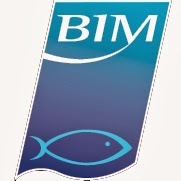 BIM’s application for a licence for Galway will more than double the State’s current farmed salmon output, the group said. The decision to launch a boycott for Christmas originated at a meeting in Bantry last month and was supported by An Taisce, Coastwatch, the Irish Seal Sanctuary, No Salmon Farms at Sea, Salmon Watch Ireland, and others, Friends of the Irish Environment said. However, John Browne of the family-owned De Brun Iasc near Dingle, says it will hit the small salmon organic salmon farmers as well as small companies like his. “We buy all our salmon from an organic producer in West Cork. We wanted to use only wild salmon but the ban on salmon fishing put an end to that,” he said. Meanwhile, a number of Cork-based groups backed by national organisations are planning to march tomorrow on the Carrigaline constituency office of Simon Coveney, the agriculture, marine, and food minister. Ian Powell of Blackwater Lodge salmon fishery, a tourist facility in Waterford, said he will be taking part in the march on Mr Coveney’s office on Saturday. Photo's of the Protest March in Carrigaline December 15th 2012. No sign of Minister Simon Coveney! The National Inland Fisheries Forum (NIFF) has criticised as "flawed" the consent process regarding the proposed deep-sea fish farm in Galway Bay which has stirred much controversy in recent weeks. the "specific statutory basis" on which BIM authorises aquaculture operations "has not been adequately set out". The letter reiterates Inland Fisheries Ireland's (IFI) criticisms of the Environmental Impact Statement (EIS) carried out on the proposed location of the 15,000-tonne organic salmon farm off the Aran Islands, stating the NIFF's believe that the document "is deficient in a number of areas" such as not adequately addressing wild salmon migration routes, and making presumptions on the potential impact of sea lice and escaped farmed salmon on adjacent fisheries. The forum also has concerns regarding the public consultation itself, noting that requests for "specific scientific information used to underpin statements in the EIS" have not been followed through. "The forum believes that on the basis of the information supplied, the minister is not in a position to make a positive decision on this application," writes Davis. "To do so would represent a failure to adhere to the precautionary principle" which applies "where there is uncertainty as to the existence or extent of risks". Shoppers are being encouraged to boycott farmed salmon by Irish anglers, coastal communities, and environmentalists opposed to the further expansion of fish farms around the coast. Campaigners say wild salmon and trout stock are threatened by the salmon farms, that traditional shellfish grounds will suffer, and that seawater will be poll-uted if the increase in salmon farms goes ahead. Up to 150 people atten-ded a meeting in West Cork last month aimed at discussing the Government’s plans to promote salmon farming around the coast. Attendees agreed to picket Agriculture Minister Simon Coveney’s constituency office in Carrigaline on Saturday and to ask the public to boycott farmed salmon. Earlier this year, the Save Bantry Bay group was set up to fight Marine Harvest’s plans to develop a 100-acre organic salmon fish farm at Shot Head. Local fishermen, tourism interests, and anglers in the Aran Island are drawing up submissions to object to Bord Iascaigh Mh-ara’s planned 500-hectare deep-sea salmon farm 6km off Inis Oirr. Kerry anglers also oppose BIM’s tentative proposals to develop another salmon fish farm at Ballydavid. BIM aquaculture manager Donal Maguire yesterday told RTÉ the boycott was "an ill-considered and unfortunate move, as Irish smoked organic salmon is a premium product renowned all over the world" and that supporting the boycott would put Irish jobs at risk. Last month, Inland Fisheries Ireland (IFI) accused BIM of overestimating by 60% the number of jobs that will be created at the fish farm it wants to build off the Aran Islands. In a submission on the proposed farm’s environmental impact, the state agency charged with the protection of Ireland’s fishing rivers and sea angling, IFI warned that the farm is likely to produce up to 200 jobs, rather than the 500 promised by BIM. BIM said it was evaluating IFI’s submission and could not comment. However it stood over its figure of 500 jobs. A further 150 jobs would be created indirectly in the service sector, it said. ANGLERS in West Limerick have added their voices to a growing chorus of concern about the impact that a planned super-size fish farm off the Galway coast could have on already-depleted local salmon stocks. With salmon numbers on the River Feale already approaching an all-time low, prompting fears that all fishing on the river could be banned as early as next year, local anglers believe that a planned 456-hectare fish farm near Inis Órr could have disastrous consequences if it is approved. Brendan Danaher of the Brosna-Mountcollins Anglers said that the farm could lead to “an explosion” of parasitic sea lice which would prey on wild inland salmon making their way to Greenland to feed. “We could be looking at a huge battle over this. I was at an anglers’ meeting last week, and there’s more coming up next week. If this thing gets built, there’ll be an explosion of sea lice attracted to the cages. They’ll treat the cages with chemicals, but the lice will still do serious damage to wild smolts.” Earlier this year Bord Iascaigh Mhara made an application for a deep-sea fish farming licence off Galway bay. The Government and Inland Fisheries Ireland are supporting the proposal, which it is claimed will see up to 15,000 tonnes of salmon harvested and create as many as 350 jobs. 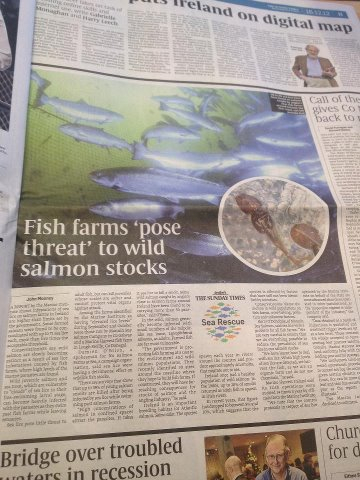 However the plans have attracted fierce opposition from inland fishing groups across the country, who fear that Ireland’s already-depleted salmon stocks will be prey to the fields of sea lice that the super sized farm would attract. Recent figures taken on an official fish counter on the Feale near Listowel showed that in the first six months of 2012 there were just 1,055 salmon on the river, a fall of more than 50% from the same period in 2011. To place that figure in context, the same counter reported 14,301 salmon on the Feale in 2007. For conservation purposes, the Feale needs to reach a quota of 4,323 salmon this year to allow for licensed angling and net fishing to take place there in 2013. 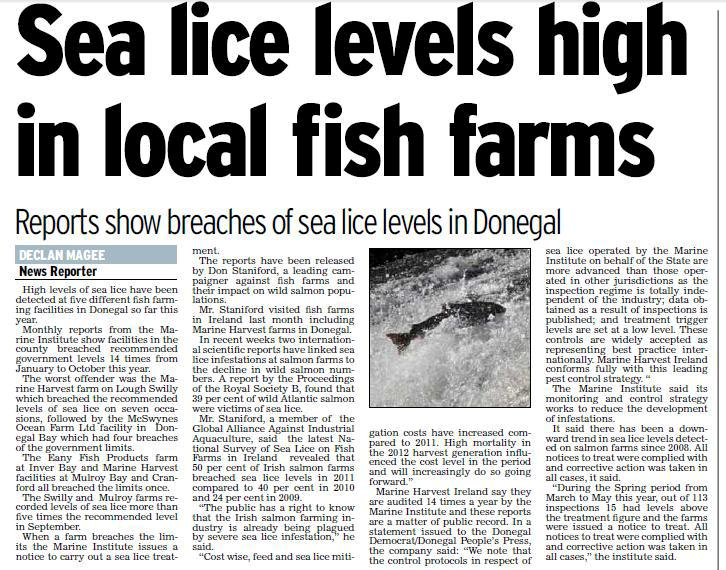 Mr Danaher said that local anglers’ concerns about the potential impact of the farm have intensified following the recent publication of an international study by the Royal Society of Biological Sciences, which found that on average 39 out of 100 wild salmon are killed by sea lice. “That’s an astonishing figure”, said Mr Danaher, adding that anglers fear that any jobs created by the farm would be offset by the loss of angling tourism to the country. An environmental impact survey regarding the Galway proposals is open to public consultation until December 12, and submissions can be sent until that time to the Department of Agriculture, Food and Marine. I oppose the "organic" salmon farming scheme which is being considered for Galway Bay. More jobs (and therefore income to the State) will be lost than gained because of the negative impact. Tourism will gradually decline in the west of Ireland, and especially in Clare and Galway, because of the unsightly pen markers and the gradual awareness in the minds of the public that Galway Bay has become an "industrial" asset of big business rather than the natural asset it is now perceived as. Moreover, the cumulative effect of the effluent and detritus from the caged salmon, along with the inevitable escapes, will adversely affect wild salmon as well as lobsters, crabs and crustaceans in a wide area. Local commercial fishermen will gradually be forced out of business and sport anglers and fly fishers will disappear. I recently spent considerable time in the Aran Islands and did not find anyone who said they favoured this proposal. 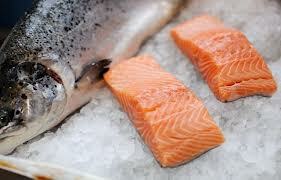 Are wild salmon bathed in hydrogen peroxide or other more toxic chemicals to remove sea lice? Or given antibiotics? Or fed chemicals to make their flesh pinker and therefore more marketable? Do wild salmon grow up confined unnaturally in pens where they have too much food and have to swim in their own effluent? 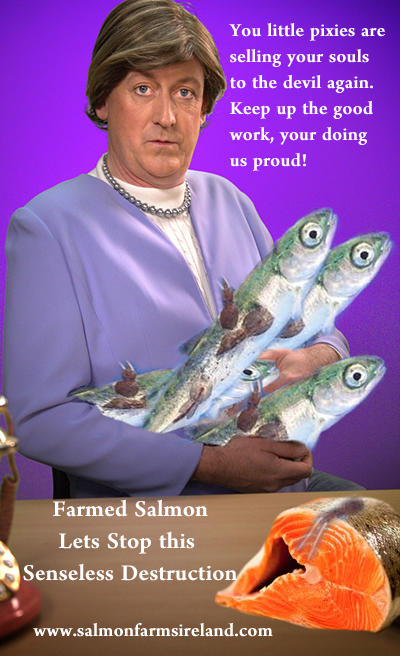 Farmed salmon are subjected to all these insults. The 500-acre pens crowded with salmon will create significant pollution which will deter people from swimming in the bay and will negatively impact other natural attractions on the west coast. The debris and pollution created by an operation of this size has been compared to the sewerage output of a city of 10,000 people. The floor of the bay would be only 50 to 100 metres below the surface and would be extremely contaminated. The debris would not be confined to the area immediately below the pens but would move around the bay. In effect, the operation would amount to pumping raw sewerage into the areas close to the Cliffs of Moher and the mouth of Galway Bay. It is hard to think of a more detrimental environmental impact, other than a nuclear power plant leaking toxic waste. This proposal constitutes one of the most egregious environmental threats Ireland has ever faced. The economic and cultural dangers are very significant and if not defeated, will permanently harm the economy, tourism, sporting and the reputation of Ireland for unspoiled natural beauty. We will be congregating at Carrigaline Secondary School at 12.00pm and march from there to Minister Simon Coveney’s constituency office. 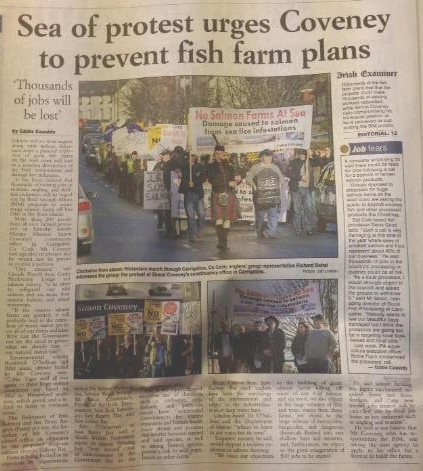 Minister Coveney has been a strong supporter of the aquaculture industry and we must let him know that his support is misguided and will result in catastrophe not only for our stocks of wild salmon and sea trout but also for the communities and local businesses that depend on there very existence.